LifeSize Room 220 brings a high quality, user friendly experience to individuals and organisations alike. Ideal for large meetings and conference rooms, the LifeSize Room 220 features high resolution, superior motion handling and low latency, and comes standard with an embedded eight-way bridge, to offer the most natural, realistic interaction that is so lifelike and crisp, it feels as though everyone is in the same room. The LifeSize Room 220 is a Full HD video conferencing system ideal for collaborating with up to eight locations around the world. You can see the most active four speakers at any one time or can choose to focus on the primary speaker. With options for a dual or third camera and dual display, you can view different room angles with a simple switch and view data on one display while seeing all eight participants on other display. 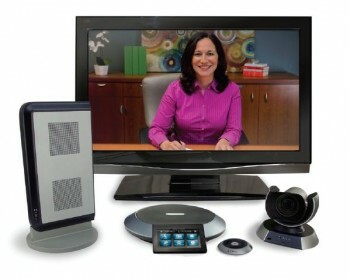 And because the LifeSize Room offers connections for additional video devices, you can use it in any working environment. The most powerful HD video conferencing solution available, the LifeSize Room 220 simply feels like being there, whether you’re in a small office or a large conference room. When paired with the LifeSize Phone, codec and Camera 10X, Room 220 is the most full-featured HD video conferencing solution available today.